Once you've discovered a joy of essential oils, you always want to use them instead of fragrant oils. By making homemade essential oils, you'll not only save money but also have lots of fun! Besides giving great pleasure in fragrant and aromatic garden, essential oils can also be extracted from the plants. Essential oils have been used for thousands of years, not only for their aromatic properties but also for medicinal and cosmetic preparations. Just as individuals have their own characteristics, and so do each species of plant. This can be shown in their color, size and also its unique fragrance. There are many fragrant plants growing all over the world and essential oils can be extracted from most of them. Oils to use: Use a refined oil to attract the essential oils of the plant. Choose one that has pale color and mild scent. Olive oil, safflower oil and sesame oil all work well. Or you can use almond oil for cosmetics, safflower or canola for general purposes, and olive oil for cooking. Flowers to use: Choose any of the following: roses, jasmine, pinks and carnation, violets, wallflowers, lavender, honeysuckle, hyancith, orange blossom, lily of the valley, sweet pea and heliotrope, frangipani, marigold. Cut the flowers just before they are fully open and where possible, use the petals only. You can use a single type of flower or a mixture of 2 or more flowers. Herbs to use: Almost any garden herb can be used to make essential oils. Cut the herbs just before the flowers open. Use the leaves and flowers, but not the woody stems. Chop the leaves before adding into the oil. Treat the leaves of scented pelargoniums in the same way. Recommended herbs are: marjoram, peppermint, thyme, lemon verbena, lemon balm and rosemary. If you want to make essential oils for cooking, you can use basil. Spices to use: Cinnamon, coriander, cloves, cumin and nutmeg (grated) are the best for homemade oils. Use a pestle or mortar to crush them before adding them to oil. Citrus to use: The zest of citrus fruits can be used to make homemade essential oils. Use them sparingly in mixtures. About 2-3 strips of zest per bottle. You can mix the plants to make oils that are used in potpourri and other scented craft items. While mixing the materials, use at least twice as many flowers as herbs and only small amounts of spices and peels. The easiest method to make essential oils is by enfleurage and maceration. In a summer time, there will be no need to heat the oil; But in the dull weather, or if you making a spice oil in winter, you can do it by maceration in warm water. Enfleurage is a method that involves steeping the plants in cool olive oil. After some time, the oil strained off and the plants are replaced with fresh ones. This process is repeated until the strength of the aroma of oils meets your requirements. Maceration is the same method as above except that the container of the oil is placed in hot water for a few hours each day to speed up the process. Note : The amount of the plant materials needs to be renewed several times. So prepare that in double or triple amounts. Put the oil into the jar then add the plant material and stir. Cover tightly and leave for 48 hours in a sunny windowsill, shaking every 12 hours. Lay a piece of muslin over the bowl and strain the oils. Gather up the muslin and squeeze the material to extract as much as you can. Put the oil back to the jar and add fresh material. Continue in a same way until you get the aroma you want. If the weather is cold and dull you can place the jar in a saucepan of cold water. Slowly heat it until the water become just hand-hot. Keep it the temperature for 10 minutes. Remove the jar. Do this once a day. After final straining, you can put the oil into a dark glass bottled. The shelf life for your essential oil is 6 - 12 months if kept in a dry, dark, cool place. 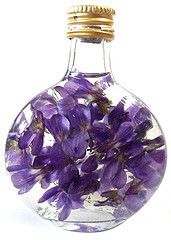 From Homemade Essential Oils Back To Aromatherapy Essential Oils.